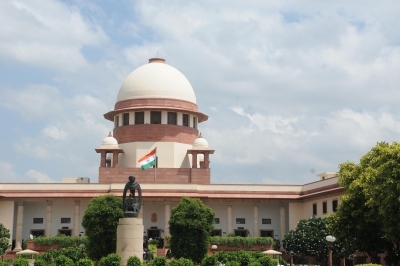 New Delhi, Oct 23 (IANS) Asking “why should we wear patriotism on our sleeves”, the Supreme Court on Monday directed the Centre to take a call on the playing of the national anthem in public places, including cinema halls. A bench of Chief Justice Dipak Misra, Justice A.M. Khanwilkar and Justice D.Y. Chandrachud said it might modify the wording of its November 2016 order on the issue so that cinema halls “may” — instead of “shall” — play the national anthem before the start of movies. The court said that while taking a fresh decision on the matter, the government will not be influenced by its 2016 order wherein playing of the national anthem in cinema halls was made mandatory. On November 30 last year, the Supreme Court ordered that the national anthem must be played in cinemas before a movie’s start to instil a feeling of “constitutional patriotism” and a sense of “committed patriotism and nationalism”. The court had made it mandatory for all those in the cinemas to stand up as a sign of respect when the anthem is played. Later, in December, the court modified its order to say that handicapped persons need not stand up. On Monday, Attorney General K.K. Venugopal, appearing for the Centre, said India was a diverse country and the national anthem needed to be played in cinema halls to bring in a feeling of uniformity. The court’s order on Monday came on a plea that sought the recall of its November 30 order. Asking why should the top court take the burden of passing an order extending the mandatory playing or singing of the national anthem in public places, the bench said the Flag Code was not exhaustive and the government could pass orders to regulate it. “People go to cinema halls for unadulterated entertainment. Why should we wear patriotism on our sleeves? These are all matters of entertainment. The Flag Code is not exhaustive. You can pass executive orders to regulate it. Why should the court take the burden of passing the order?” Justice Chandrachud observed and told Attorney General Venugopal that what the court was being asked to do could be done by the Centre. The strong observations came as Venugopal referred to religious, racial, regional and other forms of diversity in the country. He said it was necessary to have a unifying force that can be brought about by playing the national anthem. Senior counsel Chandra Uday Singh, appearing for a film society seeking recall of the November 30 order, asked then why not play the national anthem on railway platforms as well.